"We want to be able to trace the wiring of complete brain circuits," says Boyden, the study's senior author. "If you could reconstruct a complete brain circuit, maybe you could make a computational model of how it generates complex phenomena like decisions and emotions. Since you can map out the biomolecules that generate electrical pulses within cells and that exchange chemicals between cells, you could potentially model the dynamics of the brain." To expand tissue samples, the researchers embed them in a dense, evenly generated gel made of polyacrylate, a very absorbent material that's also used in diapers. Before the gel is formed, the researchers label the cell proteins they want to image, using antibodies that bind to specific targets. These antibodies bear "barcodes" made of DNA, which in turn are attached to cross-linking molecules that bind to the polymers that make up the expandable gel. The researchers then break down the proteins that normally hold the tissue together, allowing the DNA barcodes to expand away from each other as the gel swells. Using that approach, the researchers were previously able to achieve a resolution of about 60 nanometers. However, "individual biomolecules are much smaller than that, say 5 nanometers or even smaller," Boyden says. "The original versions of expansion microscopy were useful for many scientific questions but couldn't equal the performance of the highest-resolution imaging methods such as electron microscopy." "If you reduce the cross-linker density, the polymers no longer retain their organization during the expansion process," says Boyden, who is a member of MIT's Media Lab and McGovern Institute for Brain Research. "You lose the information." Instead, in their latest study, the researchers modified their technique so that after the first tissue expansion, they can create a new gel that swells the tissue a second time—an approach they call "iterative expansion." In the Nature Methods paper, the MIT team used iterative expansion to image synapses—the connections between neurons that allow them to communicate with each other. In their original expansion microscopy study, the researchers were able to image scaffolding proteins, which help to organize the hundreds of other proteins found in synapses. 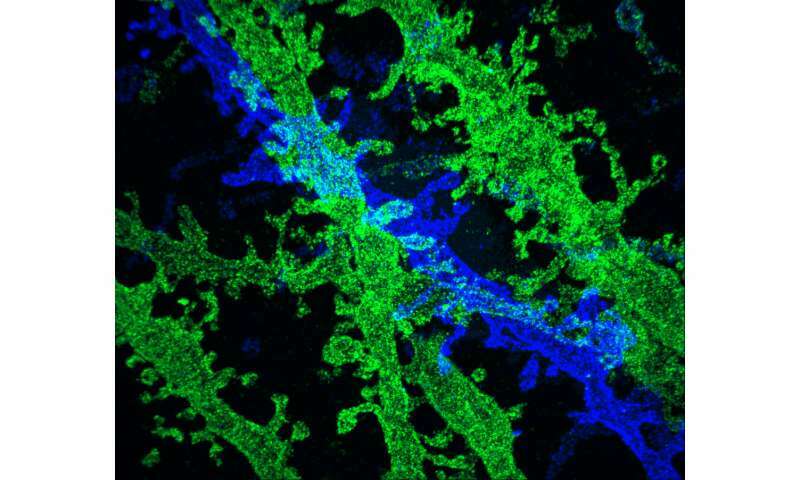 With the new, enhanced resolution, the researchers were also able to see finer-scale structures, such as the location of neurotransmitter receptors located on the surfaces of the "postsynaptic" cells on the receiving side of the synapse. "My hope is that we can, in the coming years, really start to map out the organization of these scaffolding and signaling proteins at the synapse," Boyden says. "By combining iterative expansion with temporal multiplexing, we could in principle have essentially infinite-color, nanoscale-resolution imaging over large 3-D volumes," Boyden says. "Things are getting really exciting now that these different technologies may soon connect with each other." The researchers also hope to achieve a third round of expansion, which they believe could, in principle, enable resolution of about 5 nanometers. However, right now the resolution is limited by the size of the antibodies used to label molecules in the cell. These antibodies are about 10 to 20 nanometers long, so to get resolution below that, researchers would need to create smaller tags or expand the proteins away from each other first and then deliver the antibodies after expansion.